While the days may still be a bit warm, the mornings are getting cooler and the smell of pumpkin spice is in the air. Fall is officially here and it’s the perfect time for some outdoor family adventures before the temperature drops! Here are some awesome family-friendly events going on this month in the Delaware area! Visit Fifer Orchards for fall fun including a pumpkin patch, U-pick apples, farm tours, and the Corn Maze Fun Park! 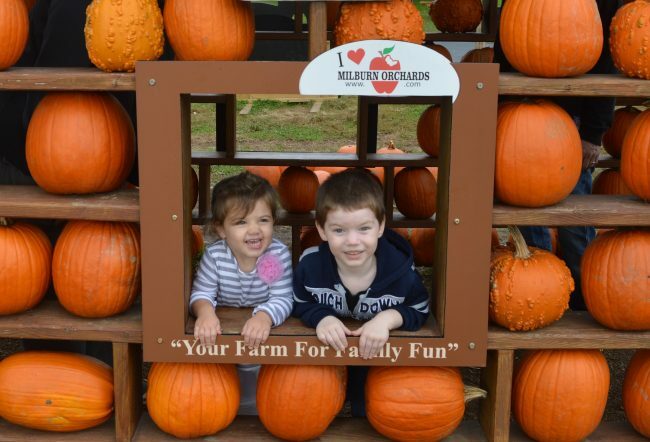 Fall Festival Weekends at Milburn’s offer families a variety of fun fall activities including the Corn Maze, Boo Barn, Barnyard Buddies Zoo, hayrides, and much more! Be sure to check out Milburn’s special event calendar for weekend themes including “Family Fun on the Farm Weekend”, “Autumn Colors Weekend”, and “Trick or Treat Weekend”. Check out pumpkins of all shapes and sizes while enjoying live music and entertainment, hayrides, train rides, pony rides, and face painting at Pumpkinland at Linvilla Orchards. Hours: September 9th-November 5th – Daily, 8am-8pm. Cost: No admission fee – tickets for activities are available near their locations. Click here for more information about Pumpkinland including ticket pricing and special events calendar. Click here for a full list of family fun at Linvilla! Delaware State Parks offer hayrides and campfires during the fall season. Costs range from $4-$7/person or $100-$125/group. Click here for full list of Delaware State Park hayrides. Experience the breathtaking fall foliage along with a hayride along the Brandywine. Family-friendly crafts are also available including leaf animals, corn husk dolls, and needle felting. Enjoy a fun-filled walk through the Haunted Zoo! Spooky, NOT scary, this event is great for family members of all ages! Warm cider & marshmallows for roasting will be provided! Get the kids all decked out in their Halloween costumes and go Trick-or-Treat through the Brandywine Zoo! Hours: October 20th & 21st 5pm-7pm. Cost: $5/person, All members and kids ages 2 and under Free. This pet-friendly annual Halloween festival is fun for the whole family and benefits Partners for Paws DE! Main Street in Newark offers twice the fun with a parade followed by Trick-or-Treat Main Street! To ensure the safety of attendees, Main Street will remain closed throughout the event. *No pre-registration required for individuals who wish to walk in the parade in costume. Check in at the information booth at George Reed Park by 2:30 p.m. on parade day. Trick-or-Treat at local businesses in Middletown. Mark your calendar for the 29th Annual Sea Witch® Festival in Rehoboth & Dewey Beach! The winner of Delaware Today’s “Best Annual Event”, this pet-friendly family fun event includes a variety of food, activities, games, and music! Don’t miss out on the action including a costume parade, dog parade, trick-or-treat, and more! The Delaware Coastal Management Program hosts this free event in celebration of the Delaware Bay and all it offers. Join in the fun and games for all ages including hayrides, crafts, local vendors, a guided hike through the Blackbird Creek Reserve, and more! Hours: Saturday, October 21st, 10am-4pm. Cost: FREE admission – food and other items will be available for purchase.